Within the Wiccan Faith, there is a wide range of sects from large to small. The larger sects, including Gardnerian Wicca, Alexandrian Wicca, Algard Tradition, Dianic Wicca, Northern Tradition, Albion Tradition, Ladywood Tradition, Aridian and Arician Traditions, Black Forest Clan, Blue Star Wicca, Covenant of the Goddess to name but a few, generally have a distinct manner in which they structure their Coven. This may be written or unwritten. Nonetheless, the different sects across the globe that participate in these sects usually adhere to the system in place. Then there are lesser known Covens, such as ours, which structure the Coven in a pragmatic and logical way to fit our particular needs. 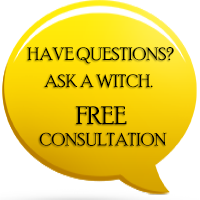 It is not necessary to have a fixed structure within your Coven, but it is often helpful in order to allow the less experienced practitioners learn from the more experienced. If an individual elects to join a Wiccan Coven, acceptance is not a given. 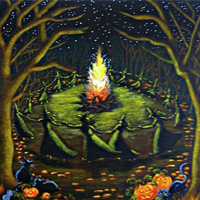 In its simplest form, a Coven is a group of Wiccans who choose to practice and worship together. There are numerous Wiccan Covens. Some are considered sects of the Wiccan faith as they diverge from the standard practices of Gardnerian, Dianic, and Alexandrian Wicca. These Covens may hold a different belief than another Coven or prioritize their aims differently. Each of these sects there might be a single, larger Coven, or multiple Covens. 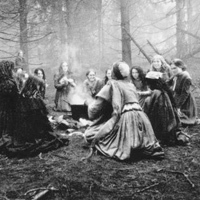 Tradition holds that the ideal number for members in a Coven is thirteen. Within the individual Coven, there is generally a structure to keep order and to design a system for advancement through training and other forms of contribution. Sometimes, there are even ardanes, or sets of rules to which the members of that particular Coven must adhere. Other than the sacred space where the Circle is located, there may be a temple or other form of sanctuary belonging to the Coven. If there is a temple, there are usually many chambers, including an adytum, or the secret chamber which holds the Coven's most confidential documents. Also, a degree-system typically exists to distinguish the experience levels amongst the members of the Coven. The highest level in which a Wiccan can attain is the fifth-degree, though sometimes this level is excluded due to the unrealistic demands that the individual must reach in order to achieve this title. In this case, the fourth-degree is the pinnacle, similar to the black belt in martial arts. British Traditional Wicca acknowledges only three degrees following Initiation. If a new initiate or member seeks to advance within the Coven, they must follow the necessary procedures to advance to the next degree. The degrees designate a system of rank, though does not nearly complete the list of positions held within a Coven. There is of course the High Priest or Priestess. His or her ranking is denoted through accessories worn. For example, the High Priest will generally wear a crown upon his head, while the High Priestess will wear a circlet. In addition, there are handmaidens, ladies, Tylers, and Guardians during Rituals, and other positions may be present depending upon the Coven. Thank you. That was interesting. Sounds structured, but allowing for some informality. Are there any covens in the Dry Ridge, Kentucky area?